My first impression of Aurora Castillo was one of quiet dignity. As she welcomed me into a tidy office at the Church of the Resurrection in East Los Angeles, I wondered if this could be the same woman who over the past five years has gained a reputation as a tough fighter against toxic pollution in her community. But, as soon as she began to speak, I knew that this was, indeed, the woman whose passion for justice was helping to hold the line against the environmental destruction of her neighborhood. "Did you see the children outside?" she asked me. "It is for them — and all the others like them — that we fight." Aurora Castillo is one of the founders of the Mothers of East Los Angeles (MELA), an organization founded in 1984 by Latina women who live in the poor minority communities of eastern Los Angeles. They banded together to block plans to build a state prison in their neighborhood — a court battle which is still going on. Soon, they faced another challenge when they discovered that the state was planning to build an above-ground oil pipeline right next to an East L.A. elementary school. The pipeline was designed to bring oil from Santa Barbara to Long Beach but was detoured through East L.A. to avoid the protests of the more affluent Santa Monica residents. The Mothers group was successful in stopping the project, but little did they know that another — even more insidious — project was being planned for East Los Angeles. What has since become known as "the Vernon incinerator" project was first brought to light in 1987. Newlyelected state Assemblywoman Lucille RoybalAllard, daughter of U.S. Representative Edward Roybal, discovered that a hazardouswaste incincerator was being proposed for the city of Vernon — and the community had no knowledge that the project had been in the works for almost two years! RoybalAllard and MELA immediately went into action to oppose the construction, even though the state had gotten all but the final permit. The project was to be situated in small, industrial Vernon — a poor Hispanic community adjacent to Castillo's East Los Angeles neighborhood. The $29 million incinerator was to be the first of its kind to be constructed in an urban area of California. And it was to burn 125,000 pounds of toxic waste every day. The State Department of Health and Safety had approved the plan in a cavalier fashion, without even requiring an Environmental Impact Report. Based on information provided to them by the incinerator company — California Thermal Treatment Services—the California Department of Health Services declared that "new safety tests showed that the plant would hurt neither the environment nor the surrounding community." Ironically, this ruling came less than a week after a huge cloud of toxic chlorine gas from a plant in the East L.A. community of City of Commerce forced the evacuation of about 27,000 people from their homes. MELA joined Roybal-Allard and the City of Los Angeles in filing suit against DHS. In the meantime, MELA mobilized community members to get active. With signs and banners reading, "The People Will Stop the Incinerator," and "Don't Poison Me," the community hit the streets. Their first march brought out more than 200 people. Subsequent rallies attracted even greater numbers as well as the support of groups like Greenpeace and celebrities like Robert Blake. "They thought that if they picked a poor community," says Castillo, "they wouldn't find any resistance. But we proved them wrong, very wrong." Indeed, the Mothers of East L.A. left no stone unturned in their effort to stop the incinerator's construction. 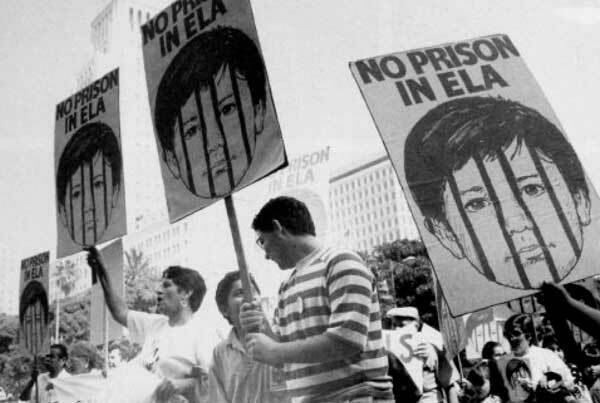 They planned demonstrations and vigils; they developed a list of more than 400 members who could be mobilized on short notice; they distributed bilingual advertisements throughout East L.A. to keep the community informed. Finally, in February, 1991 — after a six-year struggle — a threejudge panel of the California Court of Appeals found in the community's favor, requiring an Environmental Impact Report for the project. And when the California Supreme Court refused to overturn that decision, the company threw in the towel. "Interminable lawsuits" kept driving their costs up. Company officials said they would not try to locate another incinerator site in California. But although one battle against pollution has been won, the war against toxics in East L.A. is anything but finished. The triumph over the Vernon incinerator, although a landmark victory, does not mean that the people of the city are safe. Indeed, as anyone who has visited Los Angeles lately knows, the pollution levels there are staggering. In fact, a recent study estimates that L.A. County industries released more than 29.7 million pounds of hazardous chemicals into the environment in 1987 alone. And, if you add to that total the number of pounds of | hazardous waste that local industries transport through the county to other sites, the figure comes to more than 91.7 million pounds — or approximately 11 pounds per person! When the California Public Interest Research Group (CALPIRG), which conducted the study, analyzed these figures, they found that 12.8 million pounds of these chemicals have been linked to cancer; 25 million pounds are suspected of causing birth defects and genetic mutations; and another 53.6 million pounds are chemicals that have been linked to damage of internal organs and the central nervous system. The city of Vernon ranked highest in amount of toxics released and transferred — approximately 27 million pounds. Los Angeles followed closely with approximately eight million pounds. Nevertheless, EPA officials — who purportedly enforce environmental protection laws — shrugged off the report, saying it did not provide enough information to let people know whether to "be scared or not." CALPIRG authors, however, asserted that when nearly 100 million pounds of toxics are being released and transported in a county with the population density of Los Angeles, there is no question that the exposure risk is high. And nowhere is the risk more extreme than in minority communities. While wealthy and middle-class neighborhoods of Los Angeles are clustered where the air is cleanest, the city's poor are relegated to its most polluted areas. For example, according to one survey reported by Greenpeace, 70 percent of L.A.'s Blacks and 50 percent of its Latinos live in the most polluted parts of the city. Blacks and Latinos also make up the largest percentage of employees in the city's polluting industries. And nearly half of California's lead-poison victims have Latino surnames. Recently, when Dr. Russell Sherwin began examining the lungs of inner-city L. A. kids who had died from accidents or street violence, he also found that eight out of 10 already had lung abnormalities caused by breathing the city's filthy air, and more than a quarter of them had severe lung lesions! The disproportionate risk that is heaped on the city's poor is not just a characteristic of Los Angeles, though. It is observable in every major city in the United States and has led some critics to charge American industry and government with "environmental racism." In 1986, the Center of Third World Organizing reported, for example, that two million tons of radioactive uranium tailings have already been dumped on Native-American lands. According to the Centers for Disease Control in Atlanta, lead poisoning endangers the health of nearly eight million inner-city Black and Hispanic children. In 1987, the United Church of Christ's Commission on Racial Justice found that more than 15 million of the nation's 26 million Blacks, and over eight million of the 15 million Hispanics, live in communities with one or more uncontrolled toxic-waste sites. In a nutshell, all across America, toxic waste and garbage is being dumped on poor, minority communities. For example, the predominately Black/Hispanic South Side of Chicago has the largest concentration of hazardous waste sites in the nation. The country's policy of "environmental racism" exploded into public consciousness in 1987 when an opponent of the LANCER garbage incinerator project unearthed the Cerrell Report, a document prepared by the Cerrell Associates consulting firm for the California Waste Management Board. The report explained that opposition to hazardous waste projects was most likely to come from liberal, college-educated, middle- or upper-income communities. Therefore, its authors recommended, when planning for this type of project, "communities that conform to some kind of economic need criteria should be given high priority." The report recommended that companies and officials should position such projects in "lower socio-economic neighborhoods" where there was little, if any, commercial activity. Says Castillo, "So there it was in black and white. Dump your garbage in the minority, uneducated communities, they said. But they made a mistake with us. They called us a 'great sleeping giant.' But we proved to them that we are no longer asleep." Indeed, despite the array of industrial and governmental foes they have had to face, Aurora Castillo and the Mothers of East Los Angeles, are not dismayed. In fact, Castillo believes that even today's awareness of the discriminatory policies of American government and industry is a step in the right direction. It hasn't always been so easy even to explain the problem — let alone to be granted credibility by elected officials and by the press. In the 1950s, for example, when Aurora worked in a factory in Vernon, she called her employer's attention to the black residue on the sidewalks there and to the gritty feel of the soot. It frightened her that she breathed air every day that contained such grime. And it made her angry that she and her family should have to live in such an environment. But her employer just laughed when she spoke up. In fact, he told her she was "cute." Aurora eventually retired from that job. But she went on to become an activist. I asked her why she thought a group of mothers had been so successful in achieving results against overwhelming odds. She explained that it was partly because the motivation of the group was not selfinterest. "In the case of the Vernon incinerator," she explained, "it was not just our children we were fighting for but also the health and well-being of whole future generations. An Hispanic mother will turn into a lionness if her cub is threatened. You see, the mother is the soul of the family, but the child is the heart-beat. And that is why we keep fighting. To keep the heart of our community beating." Castillo is proud to point out that during the long, hard battle against the Vernon incinerator, East L.A.'s children marched and worked right alongside the mothers. She remembers, "One night we were having a candlelight march to Vernon. And hundreds of grade school children came to march with us. Well, it was a windy night and my candle kept going out as we marched. And, one by one, the children would come and re-light it. They kept my candle burning for that long, long walk. So that was kind of a symbol of the hope they gave us — and excitement and faith. The children gave us the kind of faith that can move mountains. And we did." The Mothers of East Los Angeles now number more than 400 members. They have formed a relationship with other women's groups and environmental groups around the state. They have forged an alliance with citizen's groups in West Los Angeles and with small business interests in all parts of the city. And they have gained the respect and friendship of Hispanic city officials, some of whom they actually put into office. They work closely with the predominantly Black group, Concerned Citizens of South Central L.A. (CCSCLA), who succeeded in keeping a huge garbage-incinerator project (LANCER) out of their inner-city neighborhood. Both groups are joining forces with other minority communities, such as their Chinese neighbors in Lincoln Heights. The mothers find strength in one another, in their children, and in their faith. Furthermore, they have gained confidence and no small amount of political savvy from their recent court victory. And it's a good thing they have. They barely had time to rest after the six-year Vernon fight when they heard that another insidious project was on its way. This time, a company called Chem Clear wants to build a waste and sludge cleaning plant in East L.A. The company wants to situate the plant in an area immediately adjacent to a high school and in the vicinity of several elementary schools. Needless to say, the Mothers of East Los Angeles are planning to fight the project. Industry officials contend that emissions from the plant will be minimal. "But," says Castillo, "there is already a 'minimal' emission from every factory in Vernon! They all say their emissions are minimal. But I say that the concentration of all those 'minimal' emissions is not 'minimal' anymore!" The dedication and commitment that defeated the Vernon incinerator are now being focused on the new project. It may be another long, hard battle. But the Mothers of East L.A. are ready for it. Says Castillo, "If they think we are going to sit around knitting and embroidering while they dump more dirt at our doors, they have to think again. We'll be right there, fighting every step of the way." Note: Three weeks after the Mothers of East L.A. filed a suit against Chem Clear, the company agreed to drop the project. Aurora Castillo and The Mothers of East L.A. (MELA) can be contacted through the Church of the Resurrection Parish, 3340 East Opal Street, Los Angeles, 90023 (213) 268-1141. © 1998 2010 On The Issues.